October 5, 2010 - The final Boeing 787 Dreamliner to join the flight test fleet made its first flight on Monday from Paine Field in Everett, Wash. 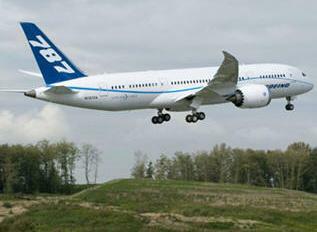 The airplane, ZA006, is the second 787 equipped with General Electric GEnx engines to fly. Captains Christine Walsh and Bill Roberson were at the controls during the 1 hour and 4 minute flight. The airplane landed at Boeing Field at 12:45 p.m. (Pacific Time). "It's great to have our last flight test airplane join the fleet," said Scott Fancher, vice president and general manager of the 787 program. "We have been focused on completing the testing required for certification of the 787 with Rolls-Royce engines, because that is the first model we deliver. A great deal of the testing that we've done also applies to the 787s with GE engines and won't need to be repeated," said Fancher. There is, however, a smaller portion of testing that is unique to the engine/airframe combination. In general, this portion includes noise testing, extreme weather operations, function and reliability, and extended operations. In addition, testing to verify the airplane handles the same regardless of engine type and that the systems work on both models is required. Some additional flight tests will be performed on one of the production airplanes, the ninth 787 to be built, but it is not considered a full-time member of the flight test fleet. In addition to achieving first flight of ZA006, the Boeing test team has completed a number of flight test milestones in recent weeks. Boeing wrapped up a series of natural and artificial icing tests, meeting all requirements with no changes required. Pilots reported that the airplane continues to handle well even in the presence of ice. Flight loads survey testing, which demonstrates the pressure distribution on the airplane structure throughout the phases of flight in a variety of configurations, also has been completed. The team conducted this testing on ZA004 primarily at the airport at Victorville, Calif. Analysis of this testing continues. A dramatic series of tests that stress the airplane's brakes, called maximum brake energy testing, was completed in late September at Edwards Air Force Base, also in California. ZA001 conducted this testing as well as a series of extreme takeoff and landing conditions including minimum takeoff speed testing. Earlier in the month, ZA001 completed wet runway testing at Roswell, NM. ZA003 flew to Glasgow, Mont., to complete community noise testing. All results were within expectations. As a result of these tests and others, all takeoff performance and handling characteristics testing is complete for the initial version of the 787. Additional testing will be required for 787s equipped with GE engines. The 787 flight test program has logged more than 1,900 hours over 620 flights and completed more than 65 percent of the flight test conditions for 787s with Rolls-Royce engines. Equally important to the testing required in the air is the ground testing required to certify a new airplane. Boeing has completed well over 4,000 hours of ground testing on the same airplanes that are in the flight test program. In addition, fatigue testing has started at a test rig in Everett. Fifteen flights have been simulated. Federal regulations require Boeing to conduct twice as many flight cycles as any airplane in revenue service. Boeing plans to have completed 10,000 flight cycles prior to first delivery. "We continue to be extremely satisfied with the performance of the 787 in its testing operations," said Fancher. "This airplane handles wonderfully and will be a valuable tool for our customers."